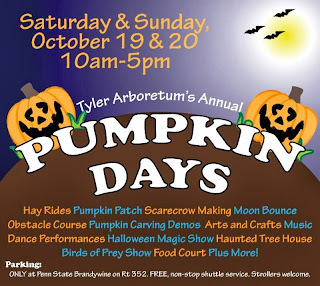 Fall family fun is in the air as the annual Pumpkin Days celebration returns to Tyler Arboretum in Media, Pa on Saturday and Sunday, October 19-20, from 10 a.m.-5 p.m.! All are invited to attend the two-day festival at Tyler, which is not only an enjoyable time filled with family friendly activities, games, demonstrations, performances and food, but also serves as Tyler’s largest public fundraiser of the year. This year’s lineup of demonstrations and activities has something for everyone on both days. From the classic hay rides, pumpkin patch and pumpkin painting, scarecrow making, arts and crafts and face painting, the 2013 Pumpkin Days will also offer a moon bounce and inflatable obstacle course, a haunted tree house, pumpkin carving demonstrations by William Rush Wood Carvers Club, glitter tattoos and hair extensions by Venus Beauty Academy, and Stubby the Helicopter from the American Helicopter Museum and Education Center. On Saturday, visitors can enjoy music by the Penncrest High School Pep Band and live shows with owls and birds of prey by Baywings Falconry. The fun continues on Sunday with dance performances by Joan’s Dance Studio and a Halloween magic show by Happy the Clown. Various games, a food court and more round out these fun-filled days. 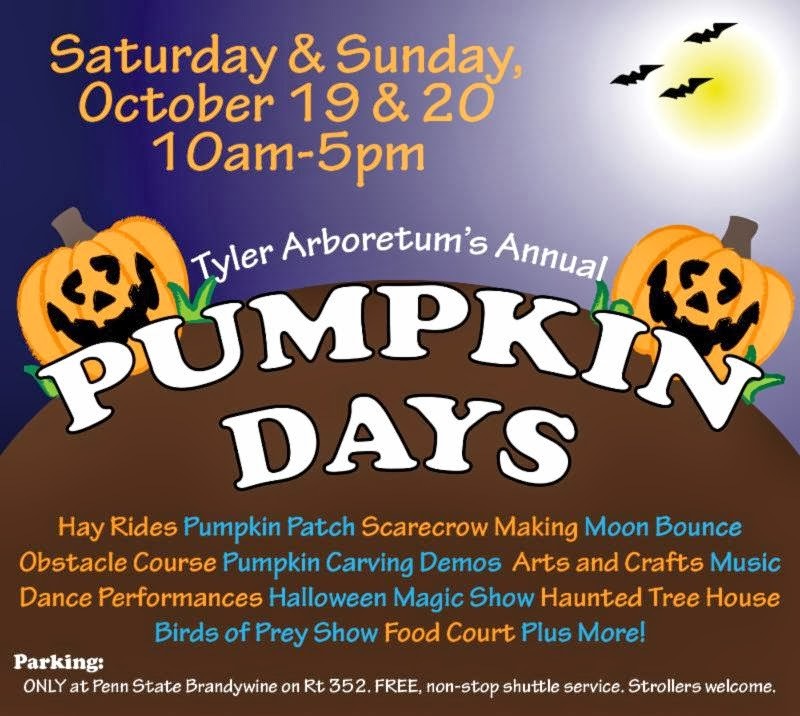 Location: Free parking for Pumpkin Days is exclusively at the Penn State Brandywine campus (on Rt 353 in Media PA), where visitors can catch the complimentary shuttle bus to and from Tyler Arboretum. Strollers are welcome on the shuttle. Parking at the Arboretum is reserved for handicapped parking (515 Painter Rd Media PA).. Cost: Because this is a fundraising event, no free guest passes will be accepted on October 19-20. Entry fees are $10 for non-member adults, $7 for non-member children, $4 for member adults, $2 for non-member children and all children under three years old are free. Some activities require tickets.